Your GRG’s Mountain Mayhem are attempting to “hustle” all the way to an undefeated 2017-2018 season with this year’s final home bout on Saturday, September 9th, at the Gallatin County Fairgrounds’ Haynes Pavilion. At 5:30 PM, the Bozone Brawlers kick off the night and will be stayin’ alive against a mix of skaters from all over Montana. 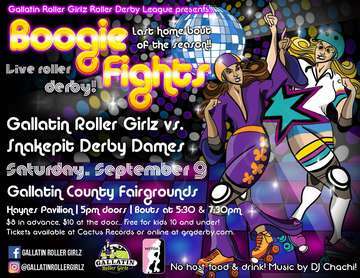 After a hard fought loss last season, your GRG’s Mountain Mayhem welcome Coeur d’Alene’s Snakepit Derby Dames for a disco-infernal rematch, sure to make you feel the heat. Tickets for Boogie Fights are $8 in advance and $10 at the door. Kids age 10 and under enter for FREE! Advance sale tickets are available at Cactus Records and Gifts or online at grgderby.com. For more information about women’s flat track roller derby and the Gallatin Roller Girlz, check us out on Facebook: GallatinRollerGirlz or at grgderby.com.